From left to right: Triumphant, Cup of Salvation, Crucified, and Good News. 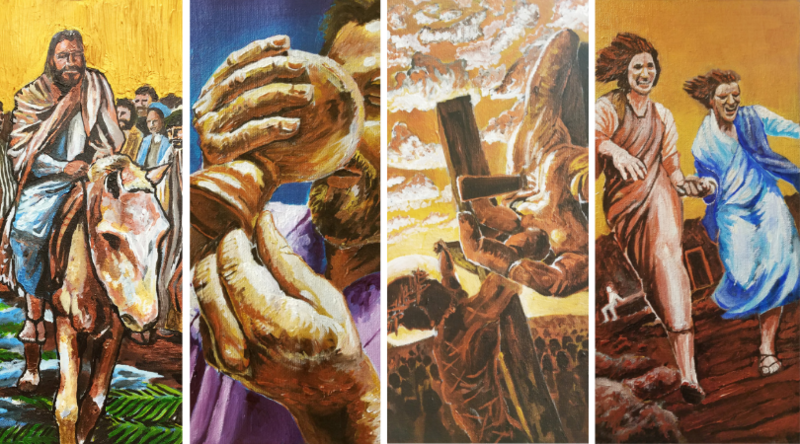 Original art by Kevin Lindholm, commissioned by Trinity for Holy Week (2017). On Palm Sunday, re-enact Jesus’ triumphal entrance to Jerusalem, by waving palms (or other branches) and singing to glorify the coming Messiah. To the Pharisees, the impromptu parade around Jesus was inappropriate, and still today such exuberance can seem inappropriate to religion. But God commands us to love him with all our heart, and at times such love is expressed in outward display. On Holy Monday, cleanse the heart through repentance and prayer, as Jesus’ cleansed the Temple. Jesus drove out the moneychangers, insisting that the Temple remain first and foremost a house of prayer and worship. Therefore we also seek to empty our hearts of any distractions, as we prepare to be a true Temple for the indwelling of our Lord. On Holy Tuesday, study God’s word and especially Jesus’ teaching, in his parables and in his conversations with the Pharisees, the Sadducees, and the Scribes. Jesus spent much time conversing with these groups in the Temple, offering especially a critique of those who only keep the law outwardly, but who do not truly love God and neighbor from the heart. On Holy Wednesday, honor Jesus with a costly gift, as did the woman who anointed Jesus with costly ointment. Judas complained that such a gift was a waste, and that it would be better to sell the ointment and give to the poor. But in his heart Judas was greedy, arranging later that night to betray Jesus for thirty pieces of silver. This day presents the stark contrast of generosity and greed, and invites us to practice the former lest we fall into the latter. On Maundy Thursday, wash one another’s feet, as Jesus did for his disciples, and then commanded them to do for each other. Then commemorate the last supper with bread and wine and songs of praise. In the evening, be sure to pray for an hour, as Jesus asked his disciples to pray in the Garden of Gethsemane. The Lord’s prayer is especially fitting, as we submit ourselves to God’s will. On Good Friday, reflect upon Jesus’ seven statements from the cross. This should be a somber day, as we consider that Christ died because of our sins, and we recognize our propensity to run from the Lord, as did his disciples. Yet it should also be a hopeful day, as we receive the grace that comes from Christ’s atonement for us on the cross. Thus this is not an easy Friday, but it is a Good Friday. On Holy Saturday, rest, as God did on the seventh day, and as Christ did in the tomb. And with others, share the good news of Christ, and the events of Holy Week, just as Christ proclaimed the gospel to the dead during his sojourn in hell. On Easter Sunday, rejoice, for Christ is risen from the dead, trampling down death by death. The resurrection of Christ is the exaltation of humility, the triumph of Christ’s obedience over Satan’s proud rebellion. Because of Easter, we realize that we need not earn our own salvation, but that God saves us by his grace, promising us eternal life by faith in His Son. Such a gift demands only praise, and leaves us with a peace that passes understanding.